What do you call a homemade system with a solar panel the size of a wall poster that can catch the sun’s rays and charge your laptop? That was the title of Gregory Lynch’s workshop on Thursday night at the Concordia Greenhouse in the Hall building downtown, where he showed attendees how they could build their own small systems and power their own devices. Today, with Canadian pipelines risking rupture, Hillary Clinton promising half a billion solar panels by the end of her first term, and China and the United States ratifying the Paris Agreement, interest in alternative energy has never been higher. Canada has yet to ratify the agreement but many Canadians are still eager to use renewable energy and save the environment—more than 20 of them had gathered in Concordia’s Greenhouse to learn from Lynch that night. Lynch had brought with him all the parts of a miniature working solar-power system, and in the palm of his hand, he held up a 5V solar panel, showing attendees how small and light it was. “It’s perfect for charging a cell-phone via USB cable,” he said. 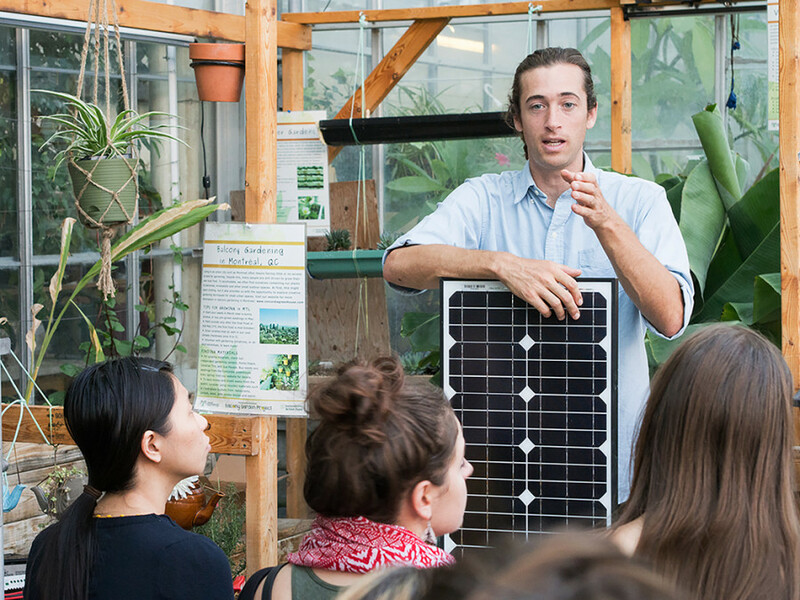 After working in the field for the past four years, the 32-year-old understands renewable energy, and in 2014 he started an organization, Mantis Environmental, to share his knowledge about sustainability and the environment with students of all ages. Lynch said he had once lived with three other people in a cabin completely powered by solar, and that today he still lives with solar energy, albeit on a smaller scale. He rigged up a system at home, for example, to water the plants on his third-floor balcony whenever the sun is shining. And many of the workshop attendees had come that night with ideas of their own. Some wanted to learn, others dreamed of building solar-powered greenhouses, and one woman said she was going to convert her RV van to run completely on solar. One attendee, Caroline Baab, 29, was looking to buy a little house in News Brunswick that is completely “off the grid,” she said. She wanted to build a solar power system to continue powering it. With the market for residential solar products growing, people can now buy pieces online to build their own passively-powered systems, Lynch said, that can heat water, move air or water plants without any electricity whatsoever. “In the past five years, solar panels have gotten stronger, cheaper and more ‘friendly,’” he said. Today, Canada is the world’s third largest producer of hydroelectricity, but the country falls out of the top five when it comes to producing solar power, according to a 2016 report by the Renewable Energy Policy Network for the 21st Century, a non-profit global policy network. But widespread production continues to make more efficient solar panels more affordable. “We’re living in a time when solar panel companies are coming and going like flocks of birds,” said Lynch. Midway through his workshop, Lynch passed around a monocrystalline solar panel with the model name, “ALEKO”. Weighing about three kilograms and roughly the same size as a flat 27-inch LCD screen, the ALEKO panel could be found online for just over $80 including shipping, and according to Lynch, it was powerful enough to charge your laptop. At just after 6 p.m., with the help of the attendees, Lynch connected the ALEKO panel with cables to a charge controller and a digital multimeter. But with the sun setting in the background, the solar panel failed to generate power and the multimeter registered no charge. Nightfall had exposed the obvious shortcomings of a system powered purely by solar, proving that while the future of solar power may be bright, it’s much better when it’s bright outside as well.